I'm not ashamed to admit it that I like saving money. Prior to our road trip and privately to myself, I decided I would be content with spending up to $500 over our budget. Taking into consideration the length of our trip and that the budget might be needed to cover any number of eventualities, I thought this was reasonable but I still loathed the thought of over spending. After getting home and doing the math, I was a very happy bunny to learn that we actually managed to come under budget by nearly $700 (around £450) so wanted to share some of the ways we managed to do it. Our daily joint budget was $80 per day including all food and drink, but not gas or lodgings. That's around £26 per person for three meals and all activities each day - sounds pretty tight for a holiday doesn't it? We definitely didn't see this as a budget trip and we wanted to have some great experiences, luxe meals and boozy nights so this was a tall order but with a bit of help from the internet and a little ingenuity we gained some excellent tips for saving money whilst travelling the States. For lunches, we usually bought food from the big supermarkets you find littered along the roads- Safeway (known as Vons in California), Ralphs, Trader Joes, Rays Food Place etc. A few days into the trip, I was getting a bit frustrated at all the signs for 20% on lunch and deli food and selected toiletries for loyalty/store card holders so I sheepishly asked one of the cashiers if we would be eligible as non-US residents. She cheerily handed me one, explaining I didn't need to send off the application form and, instead, just swipe the card at the checkout. This seemed to be the same story in each shop we requested one. They aren't quite the same as the schemes in the UK - most of them will give you up front discounts instead of points - but this is so much better for travellers who won't be around to long enough to clock up a worthwhile amount of points. Also, for the days we were staying in self-catering Airbnbs and apartments, we stocked up on wine and beer from these stores as the savings were pretty huge - around 30% off bottles of spirits and a few dollars off six packs of beer. As soon as you start planning your trip, sign up for all of the newsletters and loyalty schemes you can find for the big hotel and motel chains - Motel 6, Holiday Inn, Days Inn, Knights Inn, Best Western, Doubletree Hilton, Marriott, Comfort Inn etc. You'll hear about discounts and special offers for free nights in time to see if they'll suit your dates of travel. We found Expedia to consistently have the best rates and discount codes but also the best cash back rate with Quidco. We secured 12% cash back (the % varies from week to week) on nearly all of our hotel bookings. I received my first £60 payment a few days ago (with another £20 still to come) so it can take up to 8-12 weeks to come through but after a holiday is always when you need an extra bit of cash. Quidco is one of my all time favourite money-saving websites and I use it as my homepage for online shopping. I've clocked up nearly £200 in cash back in the last year alone! With Expedia you're also able to claim Nectar points on all bookings, so I also managed to rack up around £40 worth of points alongside the cash back! This might be a controversial one and is somewhat frowned upon but I thought I'd throw it out there anyway. Buffet breakfasts in decent hotels are plentiful so make the most of them. I'm not saying fill your boots with cereal and mini pots of jam, but pre-packaged bagels, muffins and fruit make for a great on-the-road lunch when there aren't many other (attractive) options. If you don't feel comfortable taking anything, just eat as much as you can to keep you going until dinner time! In the bigger cities when most money saving opportunities are fewer and further between, saving money on nights out is actually easier. Sign up for Uber (the taxi service) whilst you're out there and if you're using another mobile number (see my next point) you can sign up twice (or once more if you're already signed up in the UK). Doing this means you can effectively refer yourself and everyone else you're travelling with to exploit the referral bonuses plus the free first rides you'll get if you're a new user. The free first rides in the US are also of a higher value, for us it was up to $20. If you sign up using my promo code fviuy you'll get £10 credit (FYI, so will I!) and then you'll be able to start earning referral credit too. For nights out we found this invaluable and didn't end up spending any money on taxis as we managed to keep all the rides within the credit we'd earned. This was my favourite discovery, all thanks to a tip-off from my brother who used it whilst in Berlin. If you're planning on visiting for longer than a couple of weeks, we found the best deal on mobile minutes and internet was from Three. Request a free SIM from their website, activate it and top it up with £20. With this you buy a £20 All-in-One bundle which will give you 300 minutes, 3000 texts and all-you-can-eat data which will last for 30 days. You can then use this existing data abroad thanks to their Feel at Home policy. Sadly they have put the price up slightly as it was £15 when we used it but considering some of the other networks charge £5 per day to use your existing data abroad, it's a bargain. You will need to have an unlocked phone however, so this could cost you an extra £10-20 depending on your network. For longer trips, it's worth taking out a specialist credit card. I'm not your financial advisor so don't make any decisions based on my situation, but we signed up for the Halifax Clarity card which we read about on Money Saving Expert. I won't go in to it too much here but they're obviously only for people who are good at money management as they will need promptly paying off weekly/monthly. The card saved us a lot in transaction and conversion fees but if the credit card isn't for you, the link above has a very handy list of the best other debit/credit cards to use abroad. Just as a side hint, I would highly recommend taking a credit card with you to the USA. Most hotels and motels will ask you for one on check in for incidentals and to secure the room against. Some will now take debit cards, but they will 'ring-fence' an amount of money just in case which can take up to 10 working days to be released- not ideal if your card is your only source of money! If you're planning on visiting a fair few National Parks, do a bit of research and find out how much each one is. If the total comes to over $80 or if you plan on visiting the same one more than once, you're probably better off buying an America The Beautiful pass. They're available at the entrance of most of the NP's and they allow you entrance into all of them for one year. It doesn't cover Navajo Nation or other Native American governed reservations like Monument Valley as they are looked after and managed separately. The usual cost for each National Park daily entrance fee is $20-25 so you could save if you're visiting any more than 4 or 5. Ed's favourite website whilst we were in the US was Gas Buddy. Type in a city or zip code and it will find you the cheapest gas price in the area. Not that we actually needed to save money on petrol. We budgeted £1000 for gas but realised soon in to the trip that this was a vast overestimate because, compared to us unlucky Brits, gas prices in the US are almost half what they are here. We clocked up nearly 7,000 miles and in total spent just $535 (£350) on gas. Madness. Just because you're on holiday doesn't mean you can't do what you normally do. Before I book tickets for any attractions or events, I always search for discount codes or offers online that might make them a bit cheaper. San Diego Zoo is an expensive day out at $48 a ticket, but I knew it would be worth it and that we didn't want to miss out. After a couple of minutes looking online, I found a 10% code here (still valid!). Also, sign up for Groupon and Living Social whilst you're out there or change your location if you're already signed up. When you get to a city or area, have a look to see if there any are deals nearby which could come in handy. We found drinks offers for nights out and some great local dinner deals. And that's it! 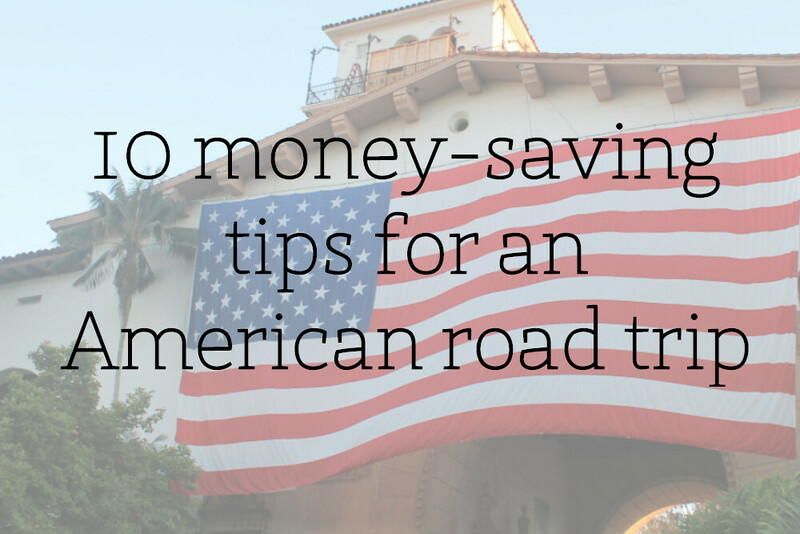 Ten of our top tips for saving money on your next USA road trip. If you have any others to add, feel free to share them in the comments below. So, my friend linked me to your blog and I've just sat down and read every last word! It brought back loads of great memories, and also some mini pangs of jealousy over places that we missed out on our trip... Me and my boyfriend did nearly 3 weeks in 2013 travelling from Seattle > Portland > Ashland > San Francisco > Cayucos > LA > Vegas (via Death Valley), staying in a variety of hotels/AirBnBs/motels along the way. We loved the Pacific Northwest too, and of course stopped in Olympia to take a photo of Sleater-Kinney road! Did you see them on their UK tour? Anyway, we're doing part 2 of our Great American Roadtrip this October. Starting in Vegas (3 nights), then on to Grand Canyon (2 nights), Monument Valley (a night in The View hotel), Grand Junction (1 night) and Denver (4 nights). The cheap tips above are brilliant - I wouldn't have thought of the National Parks pass at all. If you have any other tips on unmissable places/views/food that you haven't included in the blog I would love to hear them. Hi Lucy! Sorry for the slow reply, we didn't get a notification! Thank you so much for the awesome comment, it really makes me so so happy to read about people's familiar stories, especially when they are so similar!! Ahh Sleater Kinney! I saw them at the Roundhouse in March, they were SO good. These are great tips for any family road-tripping in the U.S. I am looking forward for our US tour with my family. Thanks for all the lovely tips. Sure this will make our adventure a memorable one. As we have seen the land showcase https://domoneyout.com/shop/fake-20-usd-notes/ hasn't managed its sharp development and is as of now on emergency. Its like you read my mind! You seem to know so much about this,like you wrote the book in it or something. 90%+ Accuracy on all VIP trades. i am here to share out my testimony on how i got back my husband, i am a lady with 2 kids i am from Indian, my husband leave me and his 2 kids for about 9 months i go through a lot of pain i do all i could to make him returned to me and to his kids but nothing works out. it was really a stressful period to me because i could dint go through the heartbreak. i was told to get a love spell doctor contacted to help me out which i did i was lucky to get DR.COROBO Contact who was able to help me out, it cast up a love spell that bring back sherry back to me and to his kids thanks so much DR. i really appreciate what you have done for me. here he his contact if you may required for it by solving your relationship email. dr.corobospellhome@gmail.com call whatssap +2348101571054 bye. Jeff M. Stewart is an online advertiser that How To Work From Home and Make Money. has been earning salary online for as far back as 5 years. Jeff is devoted to showing others how to profit online by sharing the two his insight and experience.